Home > Framing Products > Roof Trusses > Timber or Steel Roof Trusses? As roof trusses replace rafters as the standard choice for roof support in most multi-family residential buildings, Architecture & Design completed a quick overview of timber versus steel roof trusses. Roof trusses are incredibly strong and quick to install, and effectively transfer all the weight to the building’s exterior walls, relieving the load from the interior walls. It’s important to select the right roof truss solution for any building project – residential or commercial. Generally cheaper than steel trusses, wooden trusses don’t last as long because timber, being a natural material, cannot stand up to the elements as well as steel. Timber trusses are exposed to warping and bowing problems, which can cause structural damage to the rest of the building. Wood is also susceptible to rot and insect infestations, which may call for costly repairs. Timber trusses are more likely than steel to get damaged in extreme weather conditions. However, despite these risks and the possible ongoing cost of repairs and maintenance, timber frames continue to be installed in constructions because they are considered more economical. Steel roof trusses are usually more expensive than wooden trusses, but they do last a lot longer than timber and require very little maintenance. Steel trusses deliver multiple benefits to construction projects: For instance, they don’t need chemical treatments to maintain the frame; are not subject to insect infestations; and are lightweight, allowing easy and quick installation on site. 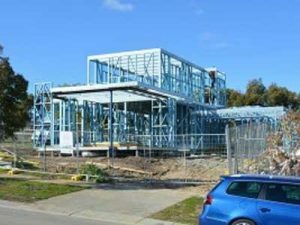 Steel frames can also be recycled easily, making this option an ideal one for the environmentally conscious home or business owner. Although steel frame roof trusses require more skill to install, an experienced team should be able to fit them quickly and efficiently.